On October 18, CallEngine Inc. attended Invoca’s Call Intelligence Summit (CIS) in Santa Barbara, California. Taking place over a 3-day period, the event attracted marketing experts from various award-winning agencies and Fortune 500 brands. 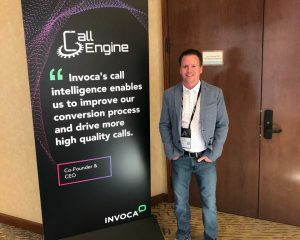 CallEngine Inc.’s CEO, Ryan McVey, at Invoca’s Call Intelligence Summit in Santa Barbara, California. With exceptional live case studies, breakout sessions, superb keynotes and social events, CIS delivered valuable insight for those in attendance. The CallEngine team would like to thank Invoca for all of the effort that went into making this years event a success. This unquestionably prosperous event definitely warrants a follow up. Congratulations Invoca Team, on a job well done. Pay Per Call is simple.